Sorry, next post will not be another book review, I promise. When I sat down to read this book, I was divided. Part of it seemed really interesting, specially the idea of converting aliens to an Earth religion. Other parts seemed, well, rather boring (the difficulties of a really long distance marriage). It turned out to be very different from what I expected. It is understated, the alien colony is almost boring and everything seems dispassionate. But there is a lot of subtle and interesting things going on at the same time. The book inverts many of the stereotypes we expect: life on an alien planet is boring while life on Earth is collapsing; converting aliens is easy, a marriage isn't. No matter how terrifying the news from Earth, it gets diluted into the everyday life of those away from the planet. And the same could be said about marriage. However, the book does lose its pacing at times. The setup of the situations was more interesting than the resolutions, unfortunately. Yes, I am being deliberately vague. A lot of the interest in the book was in finding out how things worked or didn't, at least for me. I don't want to destroy that discovery. I am somewhat divided on my feelings about this book and I think it comes through in this review! One of the things I enjoy about Blogging for Books (besides, well, access to free books to blog about) is the chance to read books I would never otherwise read, just because they are available. This week, I read "The Life Changing Magic of Tidying up" by Marie Kondo, the Japanese organization guru. Ok, this is not what I would usually read but I had heard of the book and her organizational practices, which was enough to spark an interest. I wanted to see how her outlook was different from our Occidental way of looking at the things we own and how we relate to them. I don't want to generalize an entire culture from one book, so I will stick to calling it her views. The first thing that stuck out was how much things were humanized: socks need rest, things should be thanked for their services, etc. On one level, this was cute but it started grating on me after a while, specially when things began to want to serve me or to please me. My clothes are not my pets. Another is the lack of a kitchen section- clothes, books, papers and memorabilia are her basic categories. The kitchen falls under "miscellanea", which seems overly broad. Overall, the book is quite lightweight. The basic ideas would be enough for a magazine article. The rest of the book is padded with anecdotes from clients and a lot of repeated ideas. I admit I did not like the author as she presents herself. From the start, she shows herself as something of a meddler, wanting to tell random people on the street on how to roll their socks or discarding her family's belonging as a teen to tidy and trying to make excuses or hide the fact. Although she admits the latter was a mistake, the superior attitude seems to remain, when she states that "obviously, I made [my client] through [the papers] out." She also seems almost naively young at some points. She also seems rather strongly anti intellectual in relationship to books and course material. No, I will not throw out course notes since I should have learned the information when I took the course. There is often information that will become relevant later, in a different context. Same thing for books: often, books I "should" have thrown out become incredibly useful later. At that time, I might not have been working with a particular style or technique, but I may need to look up information today (and I do). So, what did I take from the book? I am not going to go out on all day purging spree as she recommends. Perhaps I do not have much of a consumer problem but I do not feel buried in my things. I also cannot make the leap from what she suggest and the amazing results she says she gets, with clients changing their lives completely and never receding. But I did not hate the book. It was an easy ready with plenty of opportunities to roll my eyes. I loved this book for all the reasons that other readers might hate it. I found it fascinating, detailed and I loved the characters. Most of all, I loved how the engineering all played out, to show how a man (a very determined, resourceful man) might survive alone in Mars. The scientific explanations are very realistic and detailed. First, some background. The book is about Mark Watney, an astronaut who is left stranded in Mars after a freak storm hits the mission he is part of. He is left on the planet, alone, with only 31 days of food (for the 6 members of the mission) and no telecommunications. The next mission will arrive in 4 years. How can he survive until then, considering that most mistakes will be fatal? But at least he had ABBA to keep him company up there. I won't tell you his many solutions or how far they take him. But they are all well thought out and based on solid physical and engineering principles (the one time I thought "that would never work, because of...", well, Watney had, indeed, overlooked a basic principle). Everything is detailed and explained to the reader. If you enjoy ingenious technical explanations, you will love it. If you don't, the book will most likely drag and bore. But technicalities aside, the characters are compelling, the situations tense and the story line really moved along. At one point, I thought "he isn't going to get out of this - wait, there is still a third of the book to go, there has to be a solution!" Did I mention that our main narrator is also a sarcastic smart aleck? You all know how much I love a smart quip. One of my goals for this year was to have a better focus for my design work. I used to just make what came to my head, skipping across techniques and styles. It was interesting and fun, but I felt the lack of a clear direction and of an unifying principle. I began by spreading out all my current work and really looking at it - what do the piece have in common, what are their differences? What do I want to develop further, what have given me what they had to give? I rearranged them, grouped them, separated them, got them back together until I could see ideas gelling. All those disparate pieces began to talk to one another and to form groups. Finally, my body of work made sense to me. I also wanted to have an overall theme, which could be broken down to describe each line and to guide its development. I thought of using technique as a grouping principle, but I decided that was too limiting. The same outlines and ideas can be developed in different techniques and I wanted the design to lead, not the technique. I tried out using seasons or the elements. My work could fit in those categories, thematically, and I could tie it with the direction I wanted to go. But, in the end, I discarded this as well. Both of these have a limited number of subcategories (spring, summer, autumn, winter; water, fire, earth and air). What would I do when a new line came up? I don't want to discard the categorization scheme soon and these would feel restrictive in the near future. I won't bore you with all my ideas that didn't pan out. In the end, I chose to use a mythological scheme. Mythology deals with archetypes, with the broad ideas and feelings of humankind. Surely that was a scope broad enough for me to hang all my artistic development on! I am using Greek mythology, but perhaps other cultures will show up some day. The pantheon was chosen for the principles it embodies, not from a cultural or aesthetic point of view. Athena - goddess of wisdom, justice, etc, etc. She was also the sponsor of domestic arts, specially weaving. 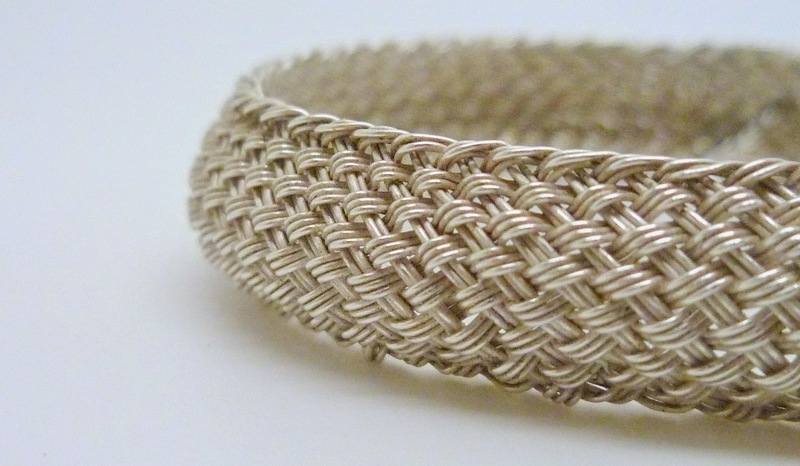 Here, you will find my woven, braided and knit pieces. Hades - lord of the underworld and of the Earth's riches - gold, silver and gems. 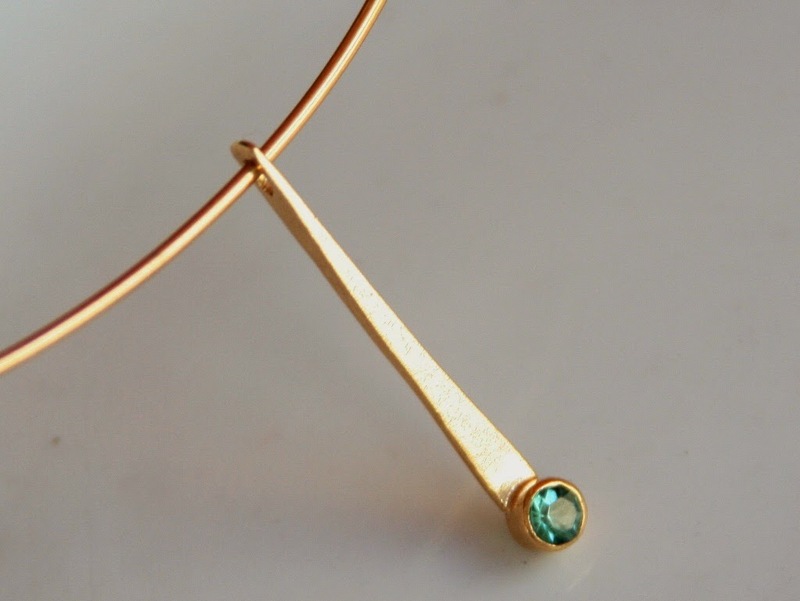 Naturally, this collection features gold and gemstone pieces. Hephaestus - the smith god, patron of artisans, craftsmen, blacksmiths, metals and metallurgy. Surely I had to include him! Under his auspices, you will find my forged and fused pieces. Hera - many people have asked me why I didn't choose Aphrodite for my wedding jewelry. Aphrodite was a goddess of passionate love, often destructive and violent. Hera was responsible for happy, long lasting marriage, for children and family life. She also got the short end of the historical stick, but that is a story for another post. Persephone - the lady of spring, vegetation and plant fertility. I took the liberty of expanding her domain a little and including some animals as well. Minimalism - ok, not mythological, I admit. But these pieces have a distinct, minimalist look of their own and I certainly intend to continue to develop this line. There is something fascinating about distilling a design to its most basic lines. Can you tell I love mythology? Yeah, just a little. The next posts will go into more detail into each of my patrons and what they represent.